Here is our coop, we still have to paint and put on roofing paper and shingles but our chickens love their home nonetheless . We've added a tri-level roost in one corner. It's really cool, it is quite easy to get onto the first and second level but roosting on the top level requires a little size in order to make the flight up there. So far it is the favorite place of 3 hens-partridge rock, americauna (ee), and dark cornish. 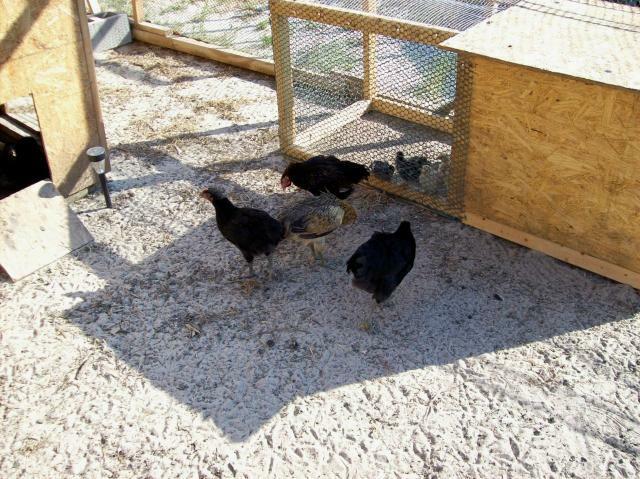 As you can see in the picture there are two doors the flock can enter and exit the coop from. 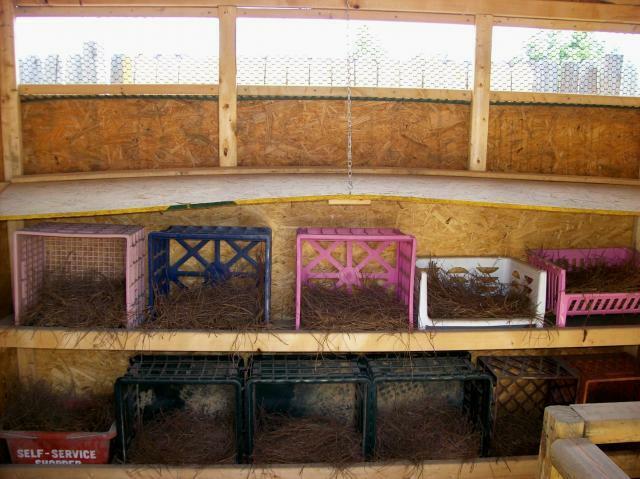 For nesting boxes we went with "given a new purpose in life" milk crates and various plastic bins. Handy hubby made two shelves for them to sit on and also a slanted top that can be adjusted. The top keeps them from roosting in the top level of nesting boxes and it is on a slant to help keep them from roosting on the top itself! 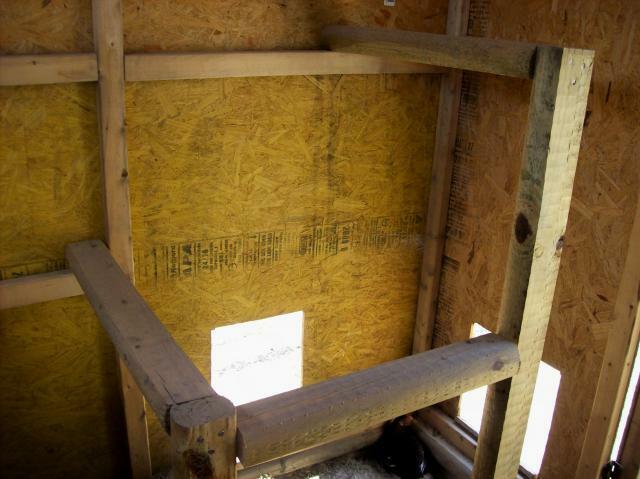 There are also 3 windows above the nesting boxes for ventilation. We are adding a hinged door to the outside of the windows so we can close them in really cold weather during the winter. Now let's check out the coop yard . 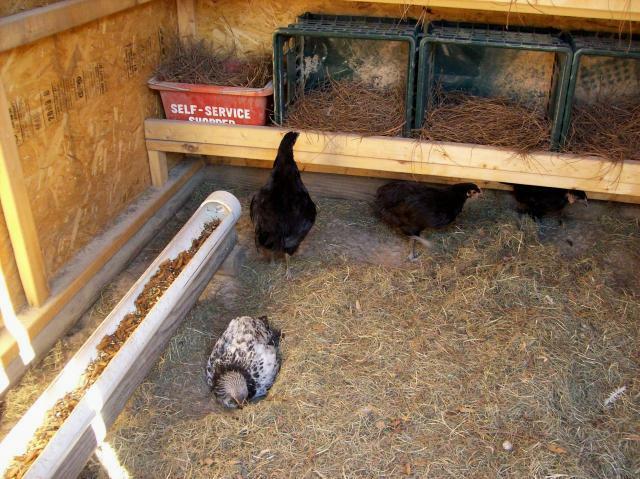 One of the main things I like about the yard is the broody box we added. We still have to paint it and add shingles to the hinged top. 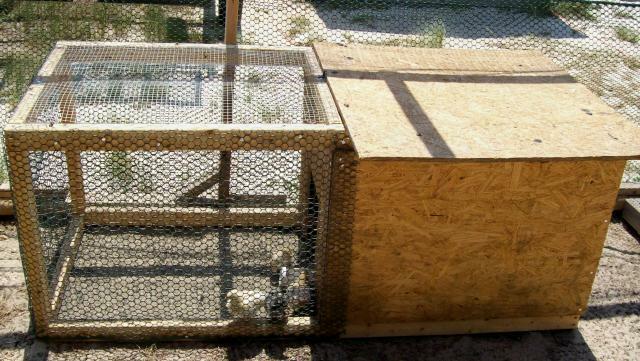 Right now it is home to about 18-four week old chicks. It's neat having them in the same yard as our older chickens yet separated so no one gets hurt.They can see each other. Once they are bigger we will combine the flocks. Back at the ranch - this is going to make a great broody box. 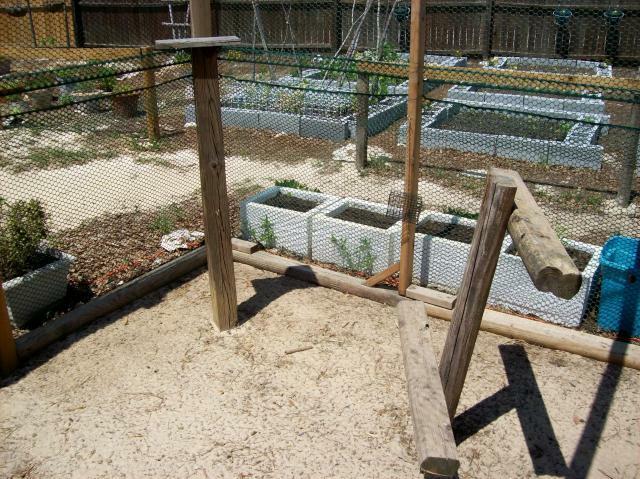 I also like that there are is a bunch of things to keep the chickens occupied while they are in the yard. We added quite a few yard enhancements starting with outdoor roosts. 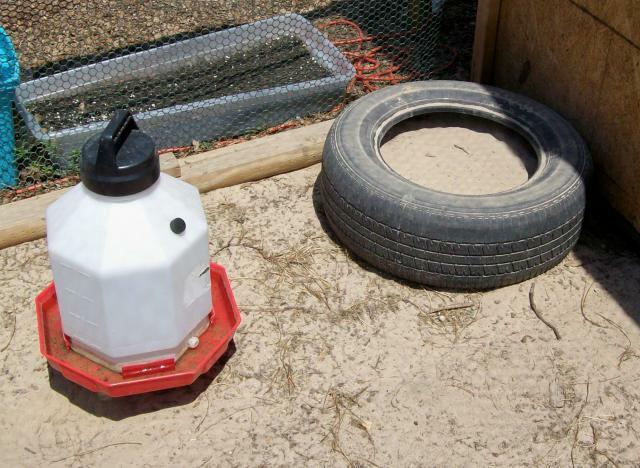 We used a "given a new purpose in life" tire to provide a dust bath area for the flock. They really love this and use it ALOT. It was mid-day when I took these pictures so they are all in the coop where it is cooler but come evening some will be in the dust bath. 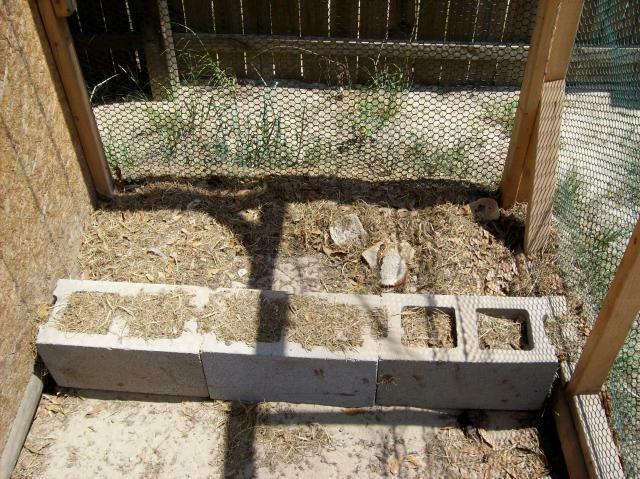 On the side of the coop, in the back of the yard we used cinder blocks to section off a small area to use as a compost bin for them. 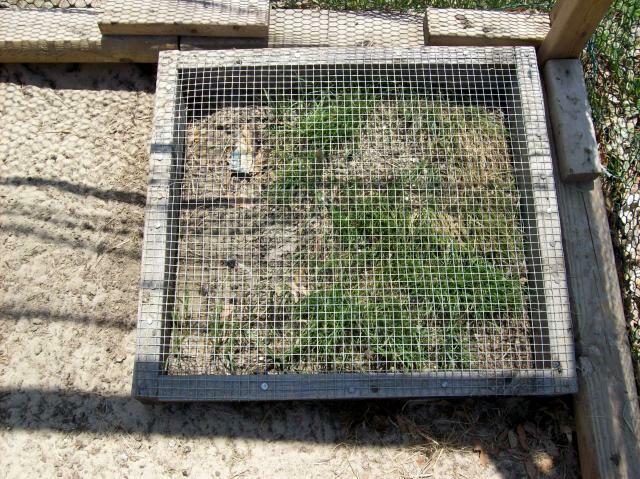 I put grass cuttings, veggie scraps, seeds, anything safe for them to eat in it. It is fun watching them scratch around in there and finding treats. Hubby put some wood together along with some hardware cloth and made a bottomless box. I put it in one corner of the yard and grew grass under it. They cannot pull the grass out by the root or scratch it up and as it grows it comes through the hardware cloth top and they can nibble on the growing tips! This idea I found online in my travels and thought it was such a great way to add another enhancement to the yard. 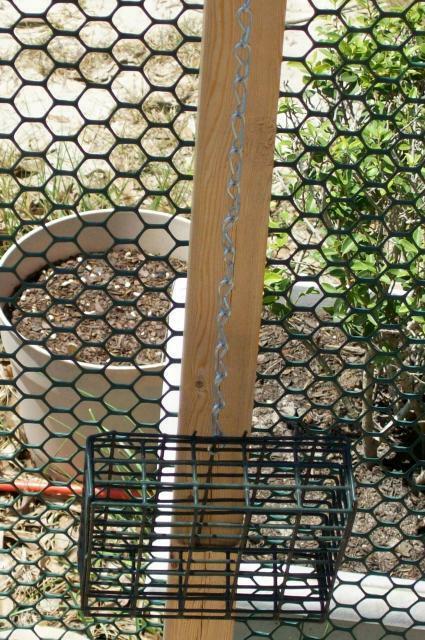 We hung two suet cages in the yard and we put veggies in them when we have extra available. 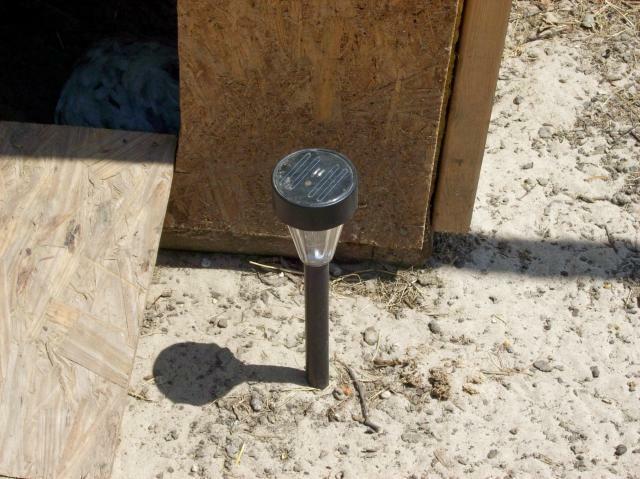 We thought by adding a solar light in the run it would attract bugs and give our chickens a late evening snack. Well, if the bugs come it must be after the chickens are already sleeping because I haven't seen it attract any bugs. I kept it in the yard though because I really like the effect it gives at night. Really cute look. As I said earlier, we still want to paint and add shingles. Choosing the colors will be lots of fun. We are also going to add that hinged door to the outside of the back windows. I'll post updates as they happen! Thanks for visiting my page here on BYC . 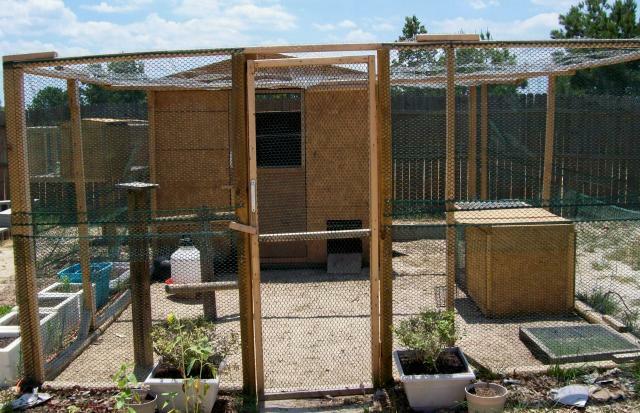 Love, love all of your ideas from the tire used for dust baths to the multi-tiered roosts as well as the compost area for them to scratch in. Would love to see the finished product paint, shingles, etc. Hope the girls are enjoying it.